Creative Space & Studio for Filming, Photography & Events in Los Angeles. Werkartz is the Prime Location for Filming, Photography & Events in Los Angeles. The gritty, industrial location features over 15,000 square feet of space. Within, the warehouse is broken into three separate and highly versatile filming and photography rental studios. These stark warehouse stages are set apart by their weathered aesthetic, bountiful natural light, and polished concrete floors. Production assets include a built-in infinity background, ample crew parking, and a variety of sets. 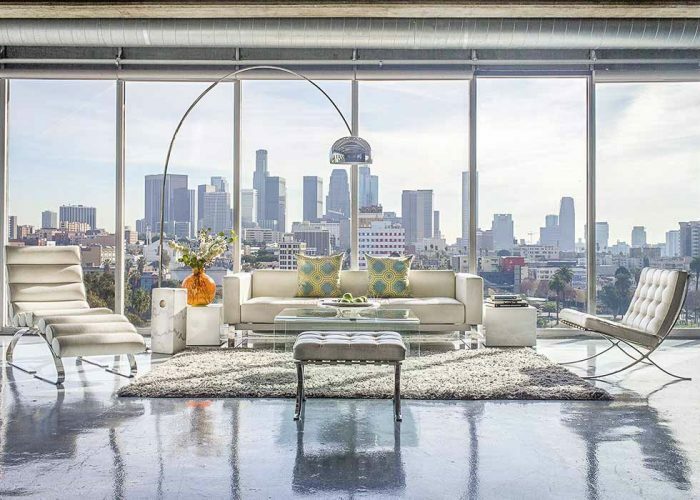 Additionally, a rooftop space opens onto a skyline view of the Los Angeles financial district. On site, a 16’ roll-up bay door and 20’ elephant doors give production the capability to load fully built sets or large elements into the space. The on-trend Werk Studios warehouse is a trusted location for Hollywood’s high-end movie, television, music video and commercial filming. It’s a perfect location for still photography and creative projects, and an iconic backdrop for high fashion and celebrity warehouse photoshoots. Over 15,000 square feet of highly transformable shooting space. A built-in infinity background, crew parking, and all amenities needed for high-end professional film and television production. Three transformable studios with a trendy warehouse aesthetic. Bountiful natural light, high ceilings, polished concrete floors, and rooftop views. A uniquely stunning space for photography. A bold, uniquely experiential space to activate pop-ups, exhibitions, company parties, product launches, and more. Werk Studios offers over 15,000 square feet of downtown warehouse filming space with a gritty, industrial aesthetic. This trendy location is a perfect home for commercials, television production, filming, and music videos. The historic venue has three separate, highly transformable creative studio spaces. Their standout features include exposed lofted ceilings, bountiful natural light, and polished concrete floors. Studio Two offers a 20’x44’ white cyclorama (infinity background) and blackout capabilities. Studio One has a 16 foot roll-up bay door, and Studio One includes 20 foot elephant doors, allowing major set pieces to be trucked into the space. An additional 5000 square feet of crew parking is adjacent to the studios. This area can also be used as exterior set space, or as holding or staging areas. Amenities include restrooms, dressing room, green room, and kitchen, as well as air conditioning, heat, and wifi. Werk Studios features a modern aesthetic, three highly transformable studio spaces, an abundance of texture, and bountiful natural light. The warehouse studio is a uniquely stunning space for photographers to rent for fashion photography, celebrity photoshoots, commercial shoots, and more. The studios boast polished concrete floors, exposed ceilings and a gritty on-trend industrial interior. Amenities include restrooms, dressing room, green room, and kitchen, as well as air conditioning, heat, and wifi. In the age of Instagram, an event space cannot be just a place: it must be an experience. Werk Studios is a bold and unforgettable downtown event venue perfect for pop-ups, exhibitions, company parties, product launches, banquets, holiday events, receptions and more. Its gritty, inviting interior has created a bold atmosphere for the private events of buzz-worthy brands such as Budweiser, Adidas, and Infiniti. The spacious layout grants event planners over 15,000 square feet of possibility in a unique space that will be remembered, posted, and shared. Adjacent to the event space is 5,000 square feet of guest parking and/or staging areas, removing the burden of challenging downtown event parking. 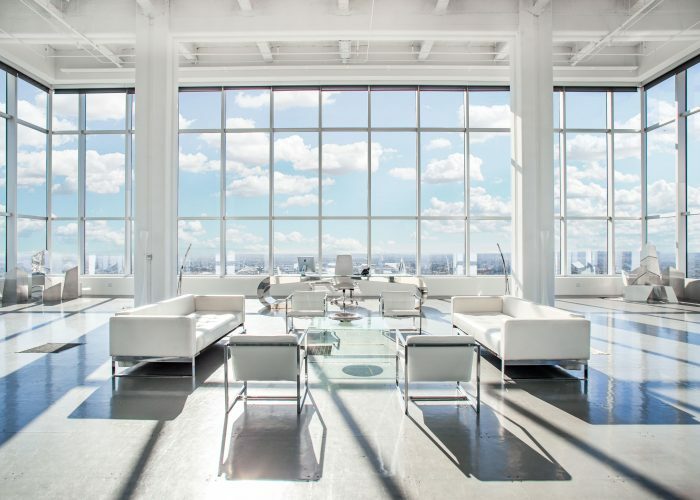 In Studio One, bountiful natural light from 35 foot lofted ceilings opens onto 8,800 square feet of space. Exposed light fixtures, metal bracing and a polished concrete floor create an industrial appeal. A 20’x44’ white cyclorama (infinity background) is built into the northeast corner of the studio, and the interior of the space has blackout capacity. Studio One rental includes an additional 5,000 square feet of outdoor crew parking which can also be used as exterior set space. 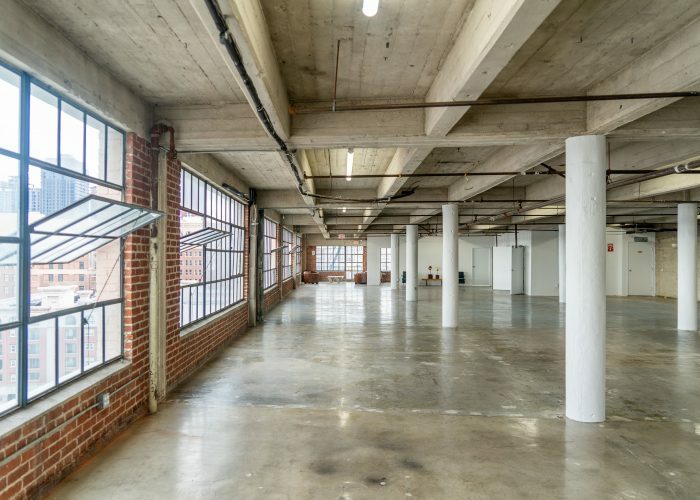 Studio Two is a perfect stark, 6600 square foot unfinished warehouse location. A 16 foot bay door opens into the studio, giving production the unique capacity to truck fully finished sets and large pieces directly into the space. 40 foot lofted ceilings are supported by exposed steel beams, and a steel spiral staircase twists upwards to a lofted mezzanine. Weathered concrete walls and iron sidings intersect with clean white support walls. The background accents include exposed light fixtures and latticed windows. An additional 5000 square feet of crew parking is adjacent to the studio. This can also serve as exterior set space, or a holding/staging area. In Studio Three, modern white walls and weathered concrete floors connect a large, maze-like network of small office-sized rooms. This multipurpose locale can transform into a variety of specific film and television sets, including an industrial office setting, a museum, or an art gallery. Studio Three also offers a variety of intimate backdrops and spaces for still photography. Werk Studio’s Rooftop space has a grungy, weathered aesthetic, with views that reveal the cityscape of Los Angeles’s business district. The downtown skyline view is textured by a network of power lines and electrical towers.